Class B campers allow notoriously little room for packing lots of clothes. So we borrowed an old sailboat trick. We divided the clothes cupboard to make 8 cubbyholes on the bottom shelf for Roger's clothes and 8 cubbyholes on the middle shelf for Lynn's clothes. Then we roll our clothes tightly and slip them in the “post office box” compartments. We pack lots of clothes this way, and they come out smooth and mostly wrinkle free.. Contrast this with clothes stacking arrangements we've seen. Two stacks, but the garment you want is on the bottom. The pile falls over on twisty roads. And pulling clothes from the middle messes up the rest of the stack. Who wants to keep refolding clothes? On our 1995 Roadtrek 190 Popular the clothes cupboard is to the right of the toilet compartment and across from the pantry cupboard. It is divided into 3 shelves. We made careful measurements (LxWxD) of the middle and bottom area. The back wall is not straight so careful measurements and fitting is required. We made corrugated cardboard dividers to get the fit just right. Trim and adjust these test pieces. The horizontal dividers will get their slots half way from the back to the front. The 3 vertical dividers for each area will get one slot from front half way toward the back. If you spread the first two fingers on each hand and slide them together you will see how these slots allow the pieces to be joined in a rigid unit inside the middle and bottom shelves. Juggling the pieces inside the area to fit together takes some dexterity, but that is why you use cheap cardboard to make the test pieces. Cut and adjust the cardboard pattern pieces until they are just right. Then lay the patterns on a piece of 1/8″ tempered Masonite hardboard (or very thin plywood) and cut or jigsaw the real dividers out of the Masonite. Roger sanded the edges before assembly inside the cupboard. We used some thin plywood we had laying around. Note the cubbyholes on the extreme right are a little wider than the first 3 to hold bulky trousers or big garments. The cubbyhole units do not extend to the cupboard door. This allows a space for extra items. We use double-sided Eagle Creek bag for socks on one side and underwear on the other. Those bags will fit on the top shelf in the clothes cupboard along with extra toilet paper, laundry soap, container of Happy Camper, and spare sheets and pillowcases. The cubbyholes will hold 3 rolled T shirts, 2 rolled long sleeve shirts, 2 rolled short pants or 1 pair of long pants. 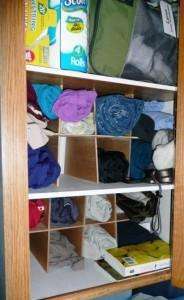 A sweater or fleece pullover takes up a whole cubbyhole so we usually hang those in the closet. For long trips, extra clothes or clothes for unexpectedly hot or cold weather are stored in a eBag or two alongside the air conditioner. We have a popup dirty clothes hamper from Walmart that stores flat on the top of the towel shelf above the toilet. When we unfold it, it rides in the toilet compartment by day and when we park it goes behind the swiveled front passenger seat. The corrugated cardboard pattern trick is useful in other ways. To the right is the basic template for the clothes dividers. Some owners have built custom cabinets for storage in their RV. If you construct a test unit out of cardboard first you may save the heartache of poor fit when you build the real cabinet. Duct tape and cardboard are cheaper than real wood and metal. Be creative! Improve your RV storage to suit your needs. I use space saver bags: one for socks/underwear, one for pants and one for tops. Squishing the air out of them helps save space and my clothes stay together like they would in a drawer. I can fit everything I need for a long trip in the small overhead cabinet that’s just past the kitchen on the driver’s side. My husband doesn’t like to be that tidy and won’t use the bags. He just stacks everything in the overhead that is above the couch — and his clothes are all over the place 2 days into the trip. Men.